Fun party decorations, with craft uses too! Decorate or cover with papier mache. Make masks, bowls, heads and more! Round, 9" diameter inflated. Assorted colors. Kids love these! So do I! I love the quality of these balloons. I've used them for years both for our neighborhood kid's parade and to pin on our preschooler's helmets/hats for the last day of our ski classes. It's a party on the hill!! Used these balloons with the hand swatters. 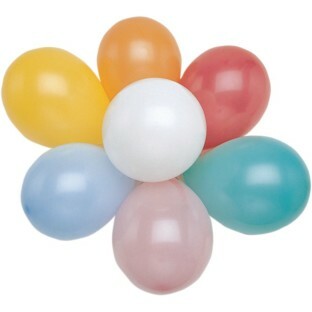 Very sturdy balloons that did not break easily when hit to the ground. We used these for several science experiments at camp and they held up very well. I expected to hear sounds of popping balloons all day and that was not the case at all. Thank you.